Damon Allen was born July 29, 1963 in San Diego, California. Prior to joining the Canadian Football League, Allen had an outstanding college career at Cal State Fullerton where he set seven single season records and was named 1st team Pacific Coast Athletic Association All-Star in 1984, as well as leading the two PCAA Championships. Allen joined the CFL when he signed with the Edmonton Eskimos as a free agent in 1985. He saw limited action his first couple seasons backing up veteran quarterback, Matt Dunigan. He replaced an injured Dunigan during the 1987 Grey Cup game leading the team to victory and earning Most Valuable Offensive Player honours. Allen signed as a free agent with the Ottawa Rough Riders in 1989. In 1991, he was named a Division All-Star for the first time during his career. That season he rushed for a career high of 1,036 yards and 8 TDS, and passed for a career high of 4,275 yards with 25 TD passes. He became the second quarterback in CFL history to rush for over 1,000 yards in a single season. After a brief stint with the Hamilton Tiger-Cats in 1992, Allen returned to the Edmonton Eskimos in 1993. That season he lead the Eskimos to another Grey Cup victory with a 33 – 23 win over the Winnipeg Blue Bombers and was named Most Valuable Player in the Grey Cup Game for the second time during his career. He also won the Eddie James Memorial Trophy that year, as the leading rusher in the Western Division. In 1996, Allen joined the BC Lions after one season with American expansion team the Memphis Mad Dogs. In 1999 while still with the Lions, Allen was voted to the Western All-Star team. That season he threw 315 passes on 521 attempts for 4,219 yards and 22 TDs. He also ran the ball 136 times for 785 yards and 8 TDs, as well as throwing more than 300 yards on five occasions and was twice named CFL player of the week. In 2000, Allen became the CFL’s all-time leading passer, surpassing Ron Lancaster’s record of 50, 535 yards. He was the Lions’ nominee for the Most Outstanding Player, as well as leading to the team to Grey Cup victory that year. During the 2001 season, Allen moved into 1st place among active quarterbacks on the All-Passing list with 54,420 yards. He also became the first CFL quarterback to rush for over 10,000 yards in his career. In 2003 Allen was acquired from the BC Lions by the Toronto Argonauts. During this season he became the third quarterback in professional football history to pass for 60,000 yards and broke the record for Most Career Touchdown Passes with 334. 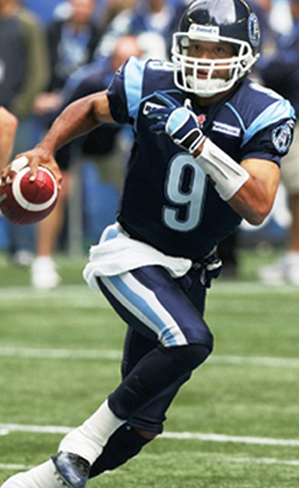 In 2004, during a game against Calgary, Allen became the second player in Toronto Argonaut history to complete more than 12 passes consecutively in a game. That season he was again named Most Valuable Player in the Grey Cup Game, when he complete 23 of 24 passes for 299 yards including 1 TD pass and rushed 5 times for 10 yards and 2 TDs. In 2005, Allen would be named the CFL’s Most Outstanding Player for the first time during his career, as well as being named a CFL All-Star, Eastern All-Star, and winner of the CFL Fan Choice Award. At the time of his retirement in 2008, Damon Allen was Pro-Football’s All-Time Passing Leader with 72,381 yards, as well as holding the CFL record for All-Time Rushing Yards by a Quarterback with 11, 914 yards. He also held the CFL record for Most Pass Attempts – 9,138, Most Pass Completions – 5,158, and Most Touchdown Passes – 394. He was ranked third All-Time for CFL service having played in 370 regular season games over 23 seasons. Damon Allen was number 14 on TSN’s Top 50 CFL Players list.